Thanks for visiting but sorry to tell you that the 2016 program for our local High Schools was conducted on the dates shown below. But if you are a first time visitor don't go; please read on and learn about this great program. This program has been developed to help today's youth have a better understanding of what is entailed in becoming a safe and responsible driver. Working in conjunction with the NSW Police, the Roads and Maritime Services Authority, local community organisations and local Liquor Accords, the campaign has run many successful sessions since its inception and with a marked decline in accidents among the shire's teenage population . The program is designed for year 11 school students in participating high schools, who have become eligible to drive and/or who have commenced driving. 1.Traffic Hints &Tips 2. Stopping time and general matters relating to learning to drive. Presented by members of the St George Youth Services, this session discusses the effects of alcohol and drugs on decision making, fine-motor skills and risk taking. Presented by members of the NRMA Motoring and Services Department, students are given an insight to the challenges facing a buyer of a used motor vehicle, highlighting the things that may not be what they are actually like. They provide helpful hints on the major items to critically examine. It should be noted that as the program depends on the availability of the Volunteer presenters who normally have full time jobs, some minor variations to the program may be required on any particular day. Wayne Teagle from YouthSafe speaking on Young driver accidents, particularly "Driver Distraction"
School Principals please Note . This program has been developed to help today's youth have a better understanding of what is entailed in becoming a safe and responsible driver. 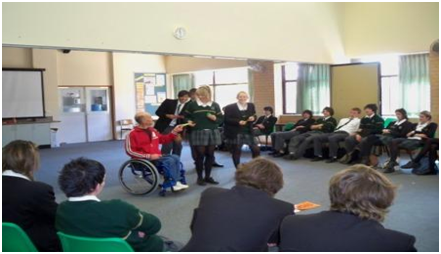 Working in conjunction with the NSW Police, the Roads and Maritime Authority, local community organisations and local Liquor Accords, the campaign has run many successful sessions since its inception and with a marked decline in accidents among the shires teenage population . 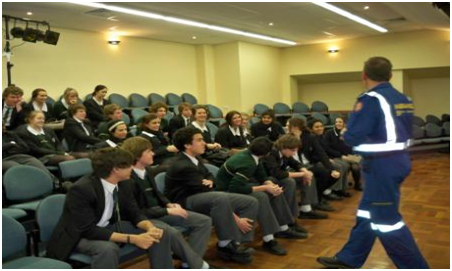 Conducted by Paramedic Staff of the NSW Ambulance Service it covers the subject of " Why crashes happen and driver attitude "
motor skills and risk taking. In this session participants are introduced to "Beer Goggles" to enable them to experience the effect of being under the influence of drugs or alcohol. 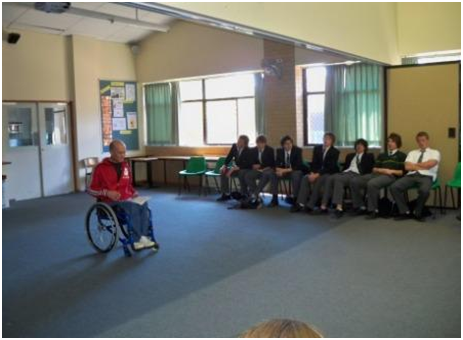 Conducted by the Brain Injury Association of NSW, their members discuss with all students, the results of accidents, the future of Victims and the impacts on families. Wayne Teagle from YouthSafe speaking on their programs and their research on Youth accidents, particularly "Driver Distraction".